Some English towns will always be associated with the phrase “well, it’s quite nice in the summer”. On a clear day that’s no problem, of course. During a miserable winter however, any town with that notion hanging over it will feel more than a little weighed down, like an overburdened milk-maid whose pigtails have been nailed to a tree. This applies to most popular-in-the-early-50’s seaside towns for example. Kendal, however, is not one of those towns, working just as well, if not better, amidst a light drizzle and under a Tudor-period ceiling of low-hanging mist. Welcome to the Lake District folks. I’m slightly wet and I like it. The challenge of course when writing about this town is avoiding any mention of old-money energy foods or, if you’re an incorrigible tangent-ist, Mr Bronson from Grange Hill. Hobo Tread has, thus far, been mint-cake free, ‘til just then in fact. However, the Mr Bronson path has been well worn already. Not quite as pleasant a path as that from Oxenholme train station down into Kendal mind you, one which is lined with fields and seemingly nothing but chalk-white housing, their property boundaries as stonewall as YOUR team’s every penalty shout. I guess in this part of the world though, you might feel a little isolated, being between the M6 and the main thrust of the Lakes. In theory, Kendal Town should own this part of the world, football wise, what with Preston and Carlisle both being a fair old drive away, Morecombe only recently arrived on the Football League scene, and both Barrow and Workington only one division higher in status, and as good as off radar anyway, operating out of Cumbria’s ocean-licking edge. By rights, Kendal should be attracting more than a seemingly fickle support that fluctuates between 200 and 400 depending on form and opposition. It even dips slightly sub-200 this afternoon, as relatively unattractive cup-ties tend to do, particularly when kick-off has not been shifted in line with public interest in an important England Euro 2008 qualifier. 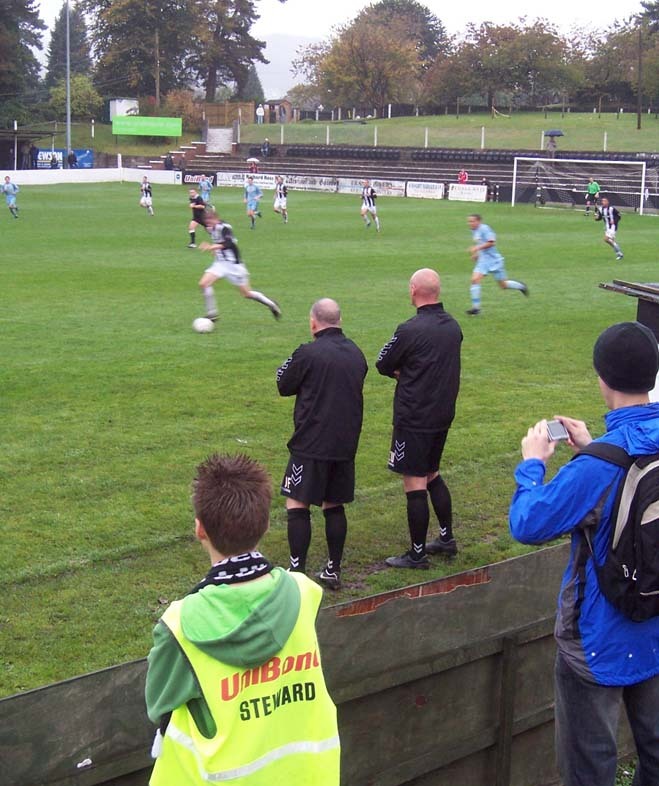 It also doesn’t help when the away support appears to consist of two blokes huddled in isolation towards the far end, both sporting faces more gritty than a Ken Loach film about cat litter. 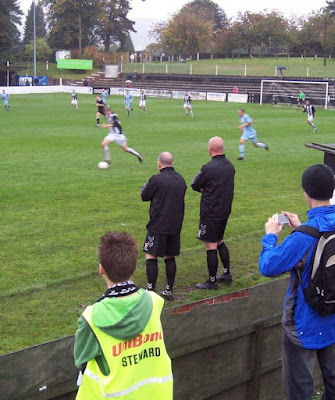 As it is a few, despite having paid their entrance fee, hang about in Kendal’s expansive social club to watch the ‘Gland go about their business. Clearly this facility is part of Kendal’s initiative to put themselves at the heart of the community, despite the ground being a mile or so away from the centre. All round the dancefloor and the many part-enclosed seating areas are painted murals of the big pop and rock star names of the last 30 years – the Bee-Gee’s, Cher, Michael Jackson and such giving it Bertie Big-Face up on the walls. Great décor perhaps for a no-knickers 80’s disco boozathon but perhaps not so ideal for their next event, a pie and peas supper with ex-Burnley and Wolves striker Steve Kindon. While we might express surprise at Kendal’s crowds, Woodley’s are perhaps to be expected, being ambitious young upstarts by comparison. Formed in 1970, fifty years after Kendal, Woodley are only in their third season in the Northern Premier League’s second tier. 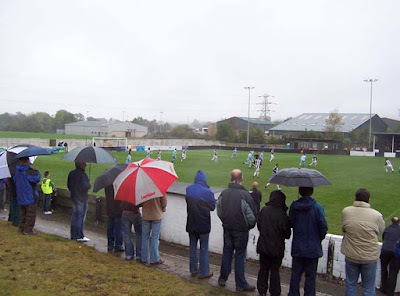 In fact, it’s only a decade since their Lambeth Grove stadium was fully enclosed which finally allowed them to leave behind the Manchester Leagues and join the senior ranks of the pyramid. There are still some safety concerns with Lambeth Grove however, although that is less to do with the synthetic pitch they’ve had installed and more to do with the occasional crossbow bolt that gets fired into the ground. 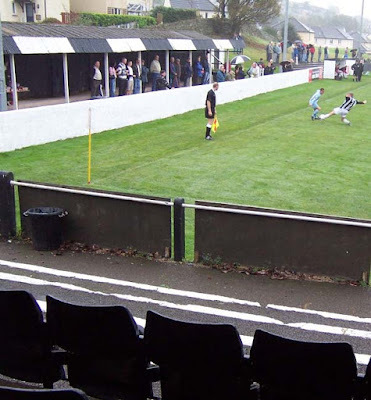 Despite being a state-of-the-art, third generation Fieldturf surface, Woodley’s decision to go placcy does impact on their FA Cup run as they are unable to play any of their home ties on it. 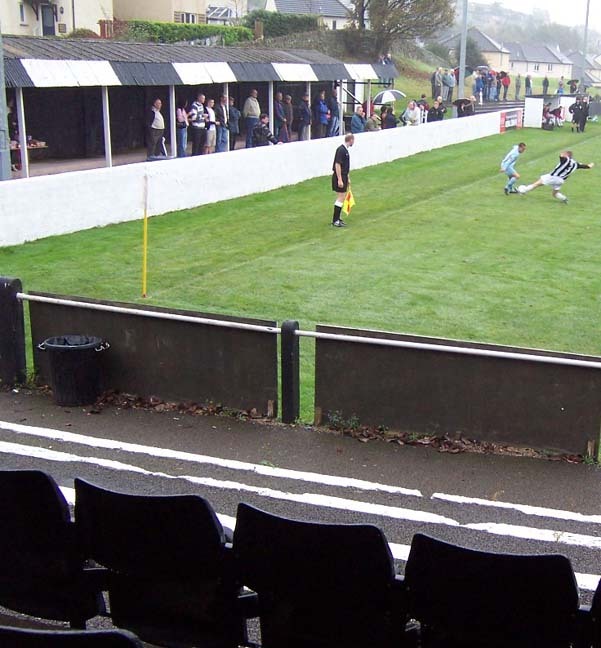 While the FA allows plastic pitches to be used in the FA Vase and FA Trophy, they remain outlawed in the Cup. Thus, had today’s game ended in a draw, the replay would have taken place at Park Road Stadium, home of Cheadle Town. However, as you’ll have spotted by now from the headline above, Woodley didn’t even come close to earning a replay, and while a four goal whuppin’ might have been harsh, it merely highlighted the fact the home side, when playing with confidence, are a whole greater than their fiddly bits. It was fairly even until the 20th minute, Gareth Arnison knocking home the opener at the near post from a Peter Wright pass. Around the half hour mark, Lee Mulvaney conjured three chances in a five minute period, but was thwarted twice by Woodley keeper Liam Higginbotham and also by a perfectly timed tackle from midfielder Andy Watson, an Anthony-Gormley-iron-cast effigy of Peter Ebdon whose jaw movement suggested he was being operated from the rear by Ray Alan. Actually, to refine that, imagine Lord Charles attempting an impersonation of Liam Gallagher buying twenty Bensons, a finger of Fudge and a can of Top Deck off a grumpy newsagent, and you’re pretty much there. Kendal were particularly unfortunate not to go into the break two-up as, after a Higginbotham save from Arnison, the ref blew for the hiatus just as Wright was about to hit his follow-up shot. Ball hit net. Ire hit ref. 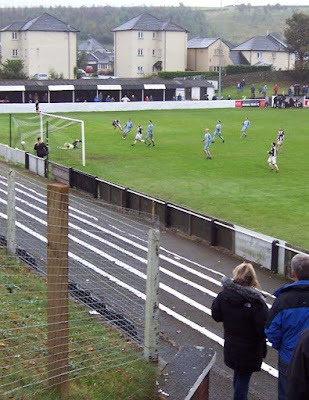 However, despite an initial resurgence from Woodley at the start of the second half, Watson going close with a big Easter Island header that flew straight into the waiting arms of Kendal keeper David Newnes, Kendal had it much their own way. After said header, Craig Hobson easily beat the leaden defence and brought another leg-based save from Higginbotham. However the resultant corner saw the ball drop to Callum Warburton outside the far corner of the penalty area and he unleashed a shot as sweet as mintc…, err, syrup into the top corner. Even I, a neutral, let out an audible exclamation; a ‘cor, look at that’ so salty it would have made Sid James blush. Playing with fluidity in the final quarter, Kendal wrapped it up with ten minutes left, Paul Byrne beating the offside tap and slotting the ball calmly beneath Higginbotham. A final flourish from Woodley required Newnes to be sharp in keeping out a Nick Robinson shot, however Kendal were able to apply some icing and a candle or two in the final minute as Wright broke down the right and powered the ball (see above) past a now very resigned Higginbotham. 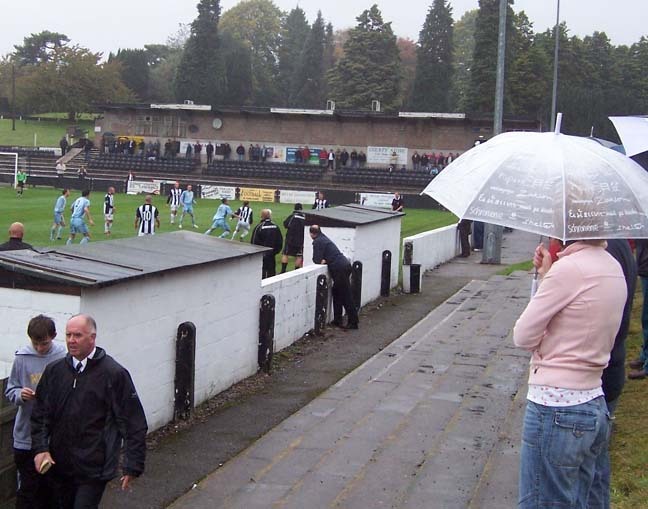 Kendal’s reward, a home tie with Conference Premier strugglers Altrincham. If they can remain confident in their abilities, a scalp may well be theirs for the taking. Von Südenfed @ London Heaven, 18oct07.